Human beings know anxiety well. It creeps up on us and seems to capture our hearts and imagination in the face of all types of circumstances. Unchecked, it spirals and compounds, morphing into a fierce beast. Who is the God who can bring ‘consolation of joy to the soul’? What does Scripture teach on the relation between the living God, human nature, and the struggles of deep anxiety? 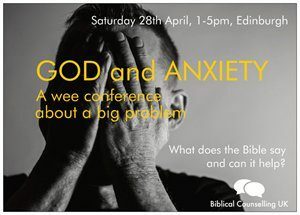 The audio below is from the conference that took place on 28th April 2018 at St Columba’s Free church in Edinburgh. You can access the talks here. A few of us went from Greenview and found the talks stimulating and helpful. You might like to look at further resources on anxiety by CCEF.